பணியிட எண்ணிக்கை :100பணியிட விவரம் :Probationary Officers (PO) - 100 postsகல்வித் தகுதி :X/ SSLC, XII/ HSC and Graduation with minimum 60 % marks under regular course. Candidate should have passed X, XII and Graduation under regular course (full time course) from a recognised University/ Institute recognised by the Govt. of India. Educational qualification by mode of distance education will not be considered. If Grade/ CGPA is awarded instead of marks, only candidates securing CGPA/ Grade equivalent to 60% or more may apply. Equivalent percentage should be mentioned at the time of application. Those who have scored less than 60% marks will not be eligible for applying. Rounding off to the nearest integer is not allowed. (for e.g. 59.99 % cannot be rounded off to 60 % )வயது வரம்பு :Less than 25 years as on 31.12.2017. Candidate should be born not earlier than 01.01.1993 and not later than 31.12.1998 (both days inclusive). South Indian Bank Limited(SIBL) Recruitment 2019 has been announced for the below vacancies. Read the following Job Notification details to get a clear idea about Registration process, Eligibility, Qualification, How to apply, No of Vacancies, Salary, Job Location, Links to apply, Selection procedure, age limit and all the instructions before applying for this job. Click the FACEBOOK ICON below To get Alerts of All Job Notifications from WAY2TNPSC Interested and Eligible Candidates can apply before 20-Jul-18. Keep on reading this page to know all the above details. So, it will be helpful to know the procedure and details for the candidates who wish to apply for this particular vacancies. South Indian Bank Limited (SIB) is a major private sector bank headquartered at Thrissur in Kerala, India. South Indian Bank has 852 branches, 4 service branches,56 ext.counters and 20 Regional Offices spread across more than 27 states and 3 union territories in India. It has set up 1334 ATMs and 42 Bulk Note Acceptor/Cash Deposit Machines all over India. Age Limit :Less than 25 years as on 31.12.2017. Candidate should be born not earlier than 01.01.1993 and not later than 31.12.1998 (both days inclusive). The selected candidates shall undergo 8-months residential campus programme at the Manipal Global Education Services Pvt. Ltd, Bangalore (MaGE) and 4 months’ internship at Bank Branch. During the Campus programme, a well-structured syllabus is designed to meet the skill sets as required and to identify candidates in areas of their excellence. On successful completion of the programme, the candidates may be awarded Post Graduate Diploma in Banking and Finance by Manipal Academy of Higher Education (MAHE) and will be absorbed to the services of the Bank as Probationary Officer in Scale I cadre. The fees for this Course will be Rs. 3.50 lakhs (all inclusive of boarding, Lodging and course fees, other fees, etc.) plus taxes, as applicable to be paid by the student.Education Qualification :X/ SSLC, XII/ HSC and Graduation with minimum 60 % marks under regular course. 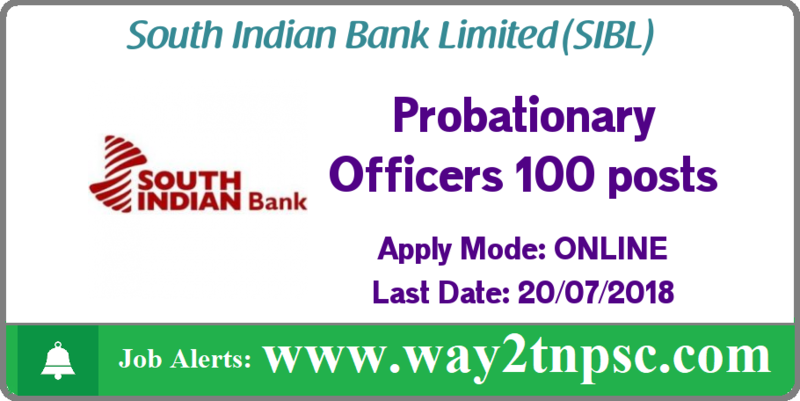 The above Notification ( South Indian Bank Limited Job Recruitment for 100 PO Posts | Apply online ) briefly describes about the details of latest announcement or notification includes important dates like release date , last date of application submission, details regarding fees, exam timings. Candidates, check all the needs and apply accordingly.